USC’s draft class has the ability to dominate the NFL for years to come, but on which teams? The NFL Draft: the place where teams choose college football's biggest stars in hopes of creating a championship caliber team. This year, as always, USC boasts a plethora of talented players ready to start their careers as professional athletes. Here, we'll predict where some of USC's star players land in the draft come April 26. Darnold is one of the most talked about prospects in this year's class, and for good reason. He is arguably the best quarterback available in an already stacked group of players at that position entering the draft. Many experts predict he will be the #1 overall pick come April, but even if he's not, most don't see him getting passed the third pick. This leaves us with the Cleveland Browns, New York Giants, and New York Jets. There are many different scenarios in predicting where Darnold will end up. It is likely he will go to the Browns at #1. The Browns may pass on him, leaving him to the Giants. There have been rumors that the Buffalo Bills are trying to trade for the Giants' #2 pick. So if the Browns don't take him, the Bills or the Giants would be able to. If for some reason Darnold falls to the Jets at #3, there's no doubt in my mind that they will grab him. Prediction: It is still unclear whether the Browns will be drafting a QB with the first overall pick, but many reports say that Cleveland is favoring Josh Allen over Darnold. In this case, the Browns pass up on Darnold (to the relief of most of us). I don't think the Giants trade their pick to the Bills, or anyone else, and instead select the QB of their future, Sam Darnold. Darnold will likely sit behind Eli Manning his first year or two, giving him the opportunity to develop his skills and for the Giants to build a team around him. 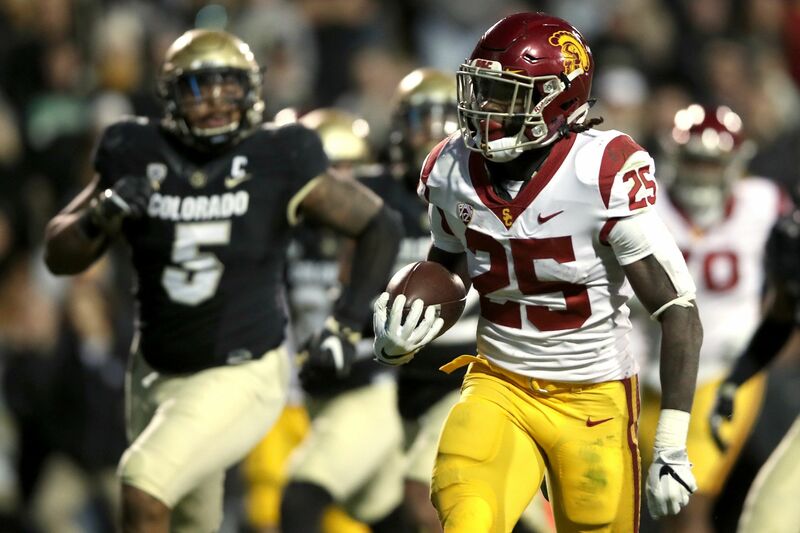 Ronald Jones II, or RoJo, as many like to call him, is also a top prospect in his position. He is a top five running back in yet another position filled with raw talent and extreme potential. He has the skill to be a first round pick, but will likely fall to the second round due to specific team needs. Apart from that, experts say he is more of a niche player. He is not someone who is going to be the "workhorse back", but he can still be very dangerous with only a small amount of touches. His best fit would be in a complimentary role to another solid running back or on a team with a higher priority on passing than running. The teams in which he could be a good fit include the New England Patriots, Detroit Lions, Tampa Buccaneers, Washington Redskins and the Indianapolis Colts. Prediction: RoJo definitely goes in the second round, it's just a matter of where. I think the most likely landing spots are the Buccaneers or the Redskins. A lot depends on how the Colts decide to draft. They have two picks in the second round immediately before the Bucs. If they choose to elect one of the better running back on the board, such as Sony Michel, then RoJo will very likely be drafted by the Bucs. If the Colts don't draft a running back, the Bucs will pick up Michel and RoJo could very well fall to the Redskins. Rasheem Green is one of the players in the draft scouts are saying has huge upside and potential. He is not quite ready for the professional scale yet, but after a year or two he could become a household name, terrorizing opposing offensive lines. One scout said they wished he would have returned to school for one more year to work on his strength and technique, as he very well could have been a top-10 pick in next year's draft as opposed to a 2nd-3rd round projection this year. There are many teams that have a need at Green's position, but he could really end up anywhere. Some teams may view him as a liability, who has the potential to stand out but could become a bust, as well. However, there are many teams who would be willing to take a risk on him. Some of the most likely landing spots for him include the Dallas Cowboys, Miami Dolphins, Oakland Raiders, and the Buffalo Bills. 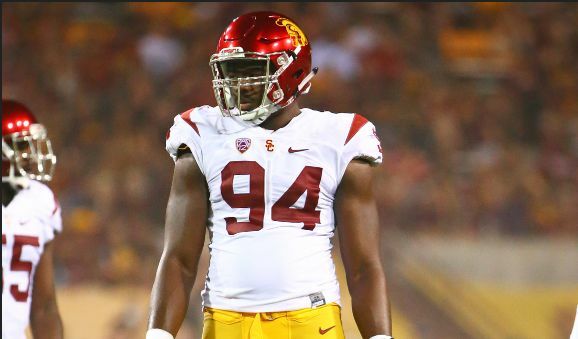 Prediction: There are many talented defensive linemen in this year's draft, so it's hard to make an accurate prediction as to where Rasheem Green will land. One possible spot for him may be the Denver Broncos in the second round. John Elway, Denver's general manager, has been known to take risks. It's possible that the he drafts Green, trusting him to develop under Denver's great defensive coaches. If Elway does not take this risk, I think Green falls to the third round to one of the teams mentioned above, most likely the Dolphins or the Raiders. Similar to RoJo, if Green isn't drafted by the Dolphins first, I think the Raiders pick him up two picks later. Where there may be doubts with Rasheem Green's abilities, there are even more doubts with Uchenna Nwosu's. 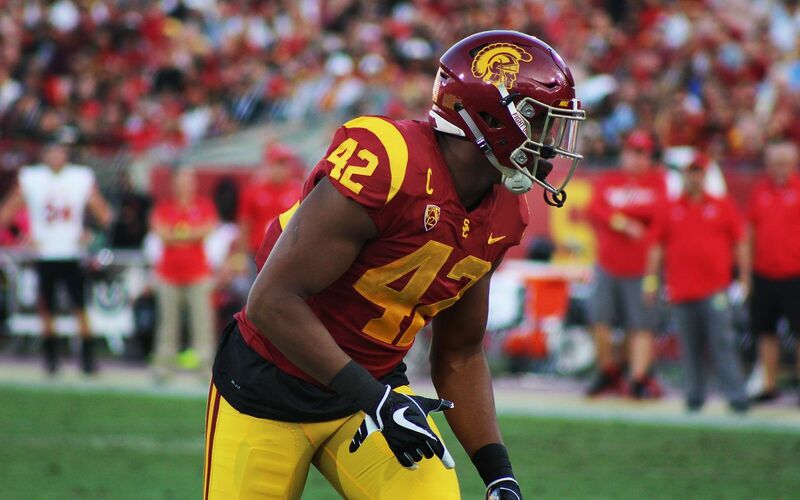 Nonetheless, Nwosu is one of USC's top draft prospects. He possesses the speed and agility of an NFL linebacker, but he is relatively inexperienced and has many aspects of his game that need improving. Many projections put him, at best, in the fourth to fifth round, while others are not so generous. I could go over all the teams the need a linebacker and who might pick Nwosu, but it seems like his future has already been determined. The Los Angeles Chargers have expressed serious interests in drafting Nwosu. Many Charger coaches were at USC's pro day to see Sam Darnold, but Nwosu stole the show for them. All indications show that if Nwosu were available in the fourth or fifth round, he would be staying in Los Angeles. Predictions: The Vikings draft Uchenna Nwosu in the third round. Just kidding. I don't think any team believes in Nwosu like the Chargers do. I am confident that he ends up in the powder blue, probably taken in the fourth or fifth round. Deontay Burnett, WR: Deontay is a speedy receiver and one of the best route runners in the wide receiver class. However, his small size presents a liability. There are many teams who have a need at the position, but he may be drafted by any team that is willing to develop him into a top tier receiver. Teams that he could find his way onto include the Chicago Bears, Green Bay Packers, Tennessee Titans, and Carolina Panthers. He will probably end up being drafted in the later rounds, most likely the fifth or sixth. Steven Mitchell, WR: Anything that could be said about Burnett could also be said about Steven Mitchell. However, Burnett is widely seen as a better pick than Mitchell. That being said, I don't think Mitchell gets drafted, but I do believe he'll end up on a team via free agency. He could go to one of the teams listen directly above that doesn't draft Burnett, or really anywhere, for that matter. No matter what, Mitchell makes his way to the NFL one way or another.